British Motor Museum to host the largest Mazda MX-5 event in the world! 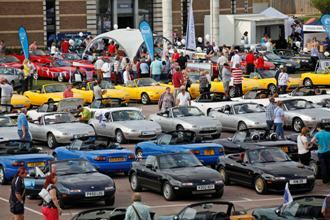 The British Motor Museum will once again play host to the MX-5 Owners Club's National Rally on Sunday 24 September. The annual gathering is recognised as the largest MX-5 event in the world and regularly attracts over 1,500 MX-5s. This year's event is set to be the best yet and on target to exceed these numbers. The Owners Club Rally, which forms the backbone of the UK's MX-5 community, is open to all owners, drivers and enthusiasts of the MX-5 and is the leading social event to meet up with owners from across the country. The day brings many opportunities to connect members to the largest selection of leading MX-5 specialists and suppliers, with technical advice, help on ownership and checking out the latest models as well as accessing some great show deals plus building useful connections for the future. A vast range of traders covering almost every model of MX-5 will be at the Rally plus there will be a wide range of products on offer with some great discounts as well as the chance to buy motoring paraphernalia. Tom Caren, Show Manager at the British Motor Museum stated "We are delighted to see the return of the MX-5 Owners National Rally which is set to be even bigger than in previous years. As well as seeing a vast array of models, the Rally is also the ideal place to treat yourself to an upgrade or a new cap in the Club store". Tickets for Non Members cost £14 for adults, £9 for children and up to £39 for a family. Gift Aid Season tickets, Tesco Club cards or any other promotional offers are not valid on this day.